Whether you have an upcoming international flight, work in a noisy office or just want to tone down the hustle and bustle of your morning commute, headphones with active noise-cancelling (ANC) can help bring you some peace and quiet. The absolute best ANC headphones can be overwhelmingly expensive, though, and the cheapest models don’t always isolate noise all that well. Thankfully, there’s a variety of mid-range ANC headphones that are a little kinder to your wallet but perform better than most budget options. We’ve tested 303 headphones and below are our recommendations for the best noise cancelling headphones under $200 to buy in 2019. If you’re looking for our top picks in general or for different price brackets, check out our recommendations for the best noise-cancelling headphones, the best noise-cancelling over-ear headphones, and the best noise-cancelling headphones under $100. The best noise cancelling headphones under $200 that we’ve tested so far are the Plantronics BackBeat Pro 2. They’re well-built, comfortable wireless over-ear headphones with an impressive battery. They have a great control scheme that is easy-to-use and efficient touch-sensitive design. They will last for 30 hours before needing to be charged again, plus they have an auto-off feature to prolong the battery life even further, which is great for road trips and long flights. They take a little over 2 hours to charge, but you can still use them while they are charging and even passively when the batteries run out. They sound decent and favor a bass-heavy sound, which fans of EDM and hip-hop are sure to love. Unfortunately, the Plantronics BackBeat Pro 2 aren’t customizable like the Sennheiser HD 4.50, so if you don’t like their bass-rich sound profile, you may be disappointed. They also don’t isolate as well as the HD 4.50, but they sound better and more exciting overall. They're also a bit more comfortable and have a much better battery. They offer great value and are good wireless headphones to wear around the office and are decent for long days of travel as well as everyday commutes. 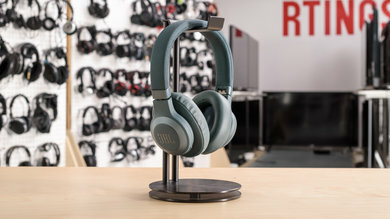 If you’re looking for a sleeker looking headset than the Plantronics without sacrificing an exciting bass, rich sound and decent noise isolation, get the JBL E65BTNC. Although the Plantronics BackBeat Pro 2 leak less sound and have a much better battery and control scheme, the JBL have a better, low profile design that some will prefer, and they're a bit more stable, in case you like to use over-ears at the gym. 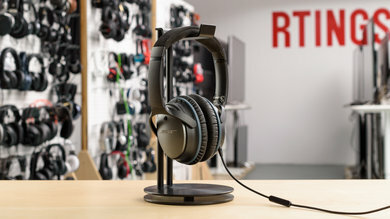 They also have slightly better bass performance and integrated microphone than the BackBeat Pro 2 and come with an in-line microphone for audio-mic compatibility with most gaming systems when used wired. The JBL E65BTNC don’t have as nice of a control scheme as the Plantronics BackBeat Pro 2, but they do have a useful dedicated Bluetooth Sync button. They also come in various color schemes and have a more stylish, streamlined look. It’s also worth checking out the Skullcandy Venue if you enjoy deep bass, but they’re not as well-built as the E65BTNC and don’t offer as good value for the price. If being able to customize your sound matters to you and you want well-isolating over-ear wireless headphones, then get the Sennheiser HD 4.50. They’re not as comfortable as the Plantronics BackBeat Pro 2 as they feel a bit tight on the head, but they fold up into a more compact design which makes them easier to quickly stash into a bag when you’re in a rush. They have a more neutral-sounding bass than the BackBeat Pro 2, but if you prefer a different sound profile you can use the Sennheiser Cap Tune app to customize them how you wish. They have a great wireless range (42 ft) and they’ll pair up to 2 devices via Bluetooth or NFC. Their battery lasts for about 22 hours, but they cannot be used while they charge. Unfortunately, their control scheme isn’t the easiest to use and they have no battery-saving feature. They’re also lacking a bit of padding under the headband to be comfortable enough for longer listening sessions. That said, they’re well-built and have a more stable fit than the BackBeat Pro 2, which is a bonus if you need to sprint to catch the bus or prefer to use over-ears for running and working out. If you’re a fan of the Cap Tune app and are willing to stretch your budget, the Sennheiser PXC 550 Wireless have even more customization options and are much more comfortable. If you prefer the breathability of an in-ear design but still want to be able to customize your sound, then get the Jabra Elite 65e. The Sennheiser HD 4.50 have more pairing options with NFC and can be used wired with an audio cable, but Jabra Elite 65e are compatible with the very good Jabra Sound+ app that lets you EQ your sound, control the ANC and adjust the microphone settings. They have a decent battery that lasts for 8.5 hours and they still provide audio while charging, which is rare for neckband-style wireless headphones. 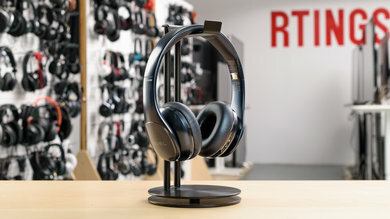 Unfortunately, the Jabra Elite 65e have pretty bad latency (218 ms) and are a poor choice for watching video or playing games, especially since there is no way to use them with a wired connection. 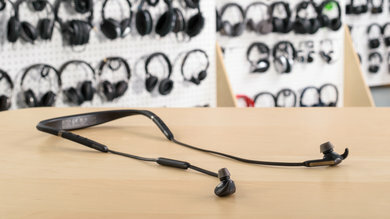 The neckband design, although well-built, may also not be for everyone, but the Jabra Elite 65e are more portable than over-ear ANC headphones. They’re a good choice for fitness enthusiasts who like to train in peace and quiet and are decent for anyone else looking for a highly customizable sound in a comfortable wireless in-ear design. If you’re looking for the best possible ANC performance and don’t mind a wired design that uses AAA batteries, get the Bose QuietComfort 25. They’re not as versatile as the Plantronics BackBeat Pro 2 since they aren’t wireless and can’t be recharged with a USB cable, but they have one of the best ANC systems we’ve seen so far. They have remarkable noise isolation performance. They mask the deep rumbles of plane or bus engines and the sound of cars passing by very well, which is great for noisy commutes. They also sound pretty good and are well-suited for a wide range of music genres. They leak a lot of sound, though, so they might not be the best for use at the office since their sound might disturb others. The QC 25 do feel a little outdated compared to our other recommendations on this list though. They’re not wireless, they use AAA batteries and they have no app support. On the upside, they have no latency issues, they get almost 33 hours of continuous playtime with a fresh set of batteries and have a much better microphone than the integrated Bluetooth mics featured on most wireless models. They’re a good choice for those who want a no-frills listening experience with simply the best noise cancellation performance under $200. If you prefer the fit of on-ear headphones and use an Android device, then get the Samsung Level On Wireless. Though the on-ear fit is not for everyone and the Samsung Level On Wireless may feel a bit awkward on smaller or larger-than-average ears, fans of this fit will appreciate their design. They sound decent, achieve average noise isolation performance for ANC headphones and don’t leak too much. The Samsung Level On Wireless shine in respect to their active features. The Samsung Level app is well-designed and offers a nice array of features for Android users, like two types of graphic equalizers and a noise-cancelling button. They also have a great battery that lasts for nearly 15 hours and charges in 2.3 hours. That’s not quite as good as the Plantronics BackBeat Pro 2, especially considering the Samsung Level-On Wireless can’t be used passively once they run out of battery, but they can be used while they charge and there’s an auto-off timer in Samsung Level app. All-in-all, they are pretty average headphones. 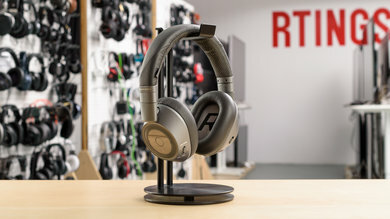 They don’t sound as good as the Plantronics BackBeat Pro 2, don’t isolate sound as well as the Bose QuietComfort 25, and don’t have as many customization features as the Sennheiser HD 4.50, but they’re also much cheaper than all these headphones. They offer decent value for their price and make for good everyday headphones. 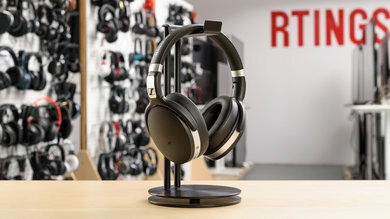 Our recommendations above are what we think are currently the best noise cancelling headphones under $200 to buy for most people. 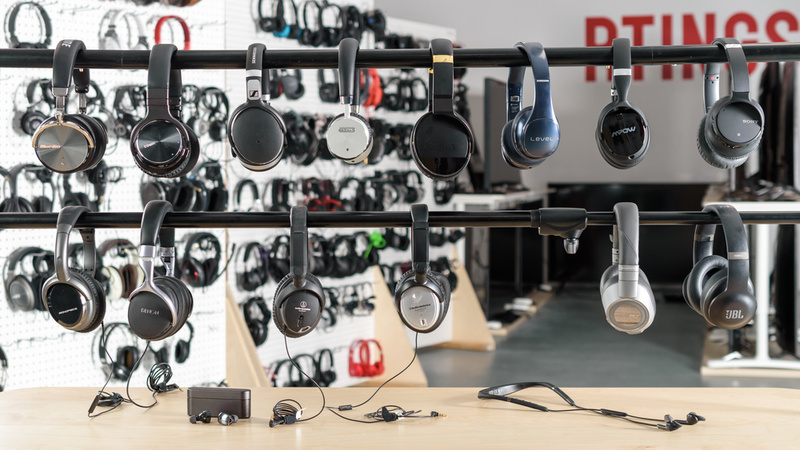 We factor in the price (a cheaper headphone wins over a pricier one if the difference isn't worth it), feedback from our visitors and availability (no headphones that are difficult to find or almost out of stock everywhere). If you would like to choose for yourself, here is the list of all our reviews for noise-cancelling headphones under $200. Be careful not to get caught up in the details. There are no perfect headphones and the level at which you play your music will naturally drown the ambient noise of lower amplitudes.